Aquaculture, a type of agriculture, is the practice of cultivating aquatic animals and plants in managed aquatic environments. Aquaculture in salt-water or marine environments is called mariculture. Fish culture, or pisciculture, refers to the husbandry of finfish . The most popular aquaculture species are finfish grown in fresh waters, accounting for over 40 percent of total aquaculture production (U.S. Department of Agriculture, 1998). Aquaculture has a long history, but for much of the world it remains somewhat of a novelty, being practiced less than agriculture or capture fisheries . Although carp ponds are rooted in antiquity, they are still popular today, and enthusiasts worldwide maintain associations devoted to these fish. Shown here are colorful koi, originally bred from the common grass carp, swimming in a pond at a Japanese garden and teahouse. 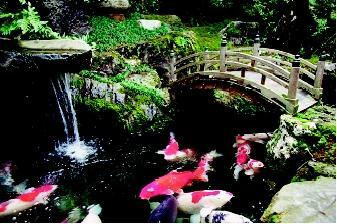 Carp have religious and cultural significance in Asia and other parts of the world. Yet as the world demand for fish increases, recent advances in growing fish in captivity have led to a rapid expansion of the aquaculture industry. During the last 30 years of the twentieth century, aquaculture grew at an average annual rate of 10 percent, and emerged as the only growth sector of the fisheries industry. At the beginning of the twenty-first century, aquaculture's share of total fish production worldwide was 25 percent, and that proportion is projected to increase. Even though the production of fish from capture fisheries has not substantially increased over the past decade (1990s), capture fisheries nevertheless account for a far greater percentage than aquaculture. The roots of aquaculture trace back 4,000 years to China where carp were cultured, and before that to Egypt where early pictorial depictions dating to 2500 B.C.E. show tilapia being fished out of a tank. The earliest known written record of fish culture techniques is attributed to Fan Li, of China, who in 475 B.C.E. described propagation methods, pond construction, and growth characteristics of common carp. From those early beginnings to the present, common carp is the best understood of all aquaculture species. Common carp reportedly were grown in Europe 2,000 years ago, and, although the ancient Greeks and Romans held fish in ponds, more advanced techniques for breeding and growing fish in managed environments in Europe were first devised 1,000 years ago. The Japanese, Polynesian Hawaiians, and Mayans were also early practitioners of fish culture. In the United States, nineteenth-century scientists developed techniques for breeding rainbow trout in captivity. Rainbow trout have since been transplanted from their native Western U.S. streams to many countries in Europe, Africa, and South and Central America. Although hatcheries serve a wide range of purposes, many cultivate fish species to supplement recreational fishing. 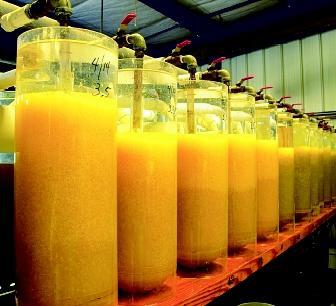 This freshwater hatchery in Indiana supports the state's stocking strategy, and annually cultivates about 30 million walleye eggs. Eggs change in color from bright yellow to black as the fry develop and hatch inside incubating cylinders. For example, aquaculturists prefer fast-growing planktivores because of their short food chain. Interestingly, biotechnological selection criteria are not always the most critical; for example, growing fish unsuitable for local or export markets can readily drive a farmer out of business. Thus, consumer preference, market conditions, regulations against nonnative species, and other economic, social, and political criteria play an important role in species selection. Hundreds of species of finfish, crustacean , mollusks , and plants are used in aquaculture. Most are finfish species, and many of these are grown as food fishes . The most common fresh-water aquaculture species are carp, tilapia, catfish, and trout. Other species are cultivated as bait fish , ornamental fish for water gardens and aquaria, sport (game) fish, laboratory fish for experimentation, industrial and medicinal products, and as native fish to mitigate losses to wild fish populations. In the United States, catfish and trout, grown as food fishes, are by far the most popular aquaculture species. But other species are also commonly grown for food, including salmon, striped bass, and tilapia. Also, there is a small industry for alligators, frogs, turtles, egg seed stock, and ornamental fishes. Aquaculture is practiced for a number of reasons, chief among them being food production and income generation. Most fresh-water aquaculture production (over 70 percent) comes from low-income, food-deficit countries. Even in the poorest countries, fish farming is seldom solely a subsistence activity. So while farmers may consume some of their product, typically fish are sold, thereby enabling farmers to earn income to purchase other goods and services. Aquaculture operations range from small, backyard water gardens to energy-intensive, large commercial farms encompassing hundreds of hectares . 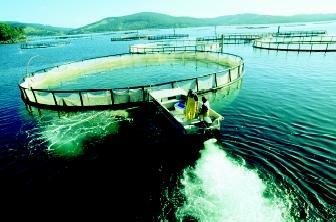 Aquaculture is sometimes combined with agriculture as in rice–fish farming, or in duck–fish ponds. It is also practiced as polyculture , where a variety of species occupying different ecological niches are cultivated together. Aquaculture involves many levels of intensity and complexity, from gravity-fed ponds with little or no inputs, to intensive systems that use aeration , supplemental feeds, antibiotics, and genetically modified species. Small skiffs shuttle 80-meter-circumference salmon rearing pens around the harbor at a commercial fish farm in Dover, Tasmania, Australia. Pens must be moved periodically to reduce negative impacts of fish waste on substrate environments below the pens. a successful operation, regardless of the culture unit. With poor water quality, for example, fish exhibit higher incidence of disease. In addition, poor water quality often yields effluents (wastewater and byproducts) that can have negative environmental effects. Not too long ago, aquaculture was perceived as a cure for hunger and dwindling wild fish supplies. At the end of the twentieth century, given the rapid growth of the aquaculture industry, critics began questioning the real social and environmental impacts of aquaculture. The social impacts are generally felt more acutely in poorer countries. For example, people have been displaced from their homes and jobs by aquaculture operations, sometimes by operations that pollute land and water previously used by local residents. Aquaculture, like any farming activity, produces effects on the environment. Aquaculture uses energy and creates wastes. As aquaculture replaces wild habitat , changes to the ecosystem inevitably occur. Even where aquaculture operations are placed in non-pristine areas, potential exists for exotic (nonnative and genetically altered) aquaculture species to escape and adversely affect native species by competing for food and space, interbreeding and hybridizing native species, and spreading disease. Collecting wild larvae for rearing in aquaculture units can decimate native populations of fish, and can affect biodiversity. Toxic and bioaccumulative compounds can be harmful to people, including fish farmers themselves, and to plants and animals. Excessive discharge of organic wastes causes pollution. The environmental impacts of effluents depend on the type of aquaculture practiced, and on farm management. Aquaculture can, in local situations, improve the environment or be environmentally benign. If ponds are properly managed, nutrient-rich discharges (soil and water) can be dredged for use in crop production, thereby reducing the need for soil amendments such as inorganic fertilizers. Fish ponds can increase bird populations, which are pleasing to birdwatchers, but are disdained by fish farmers. While poorly managed fish ponds can serve as breeding grounds for vectors of animal and human disease, well-managed fish ponds can be used to control these vectors. Thus, fish farm management geared at minimizing negative environmental effects can be critical for balancing the farm's impact on the environment, and for its own long-term success. SEE ALSO Agriculture and Water ; Fisheries, Fresh-Water ; Fisheries, Marine ; Mariculture ; Pollution by Invasive Species . Bardach, John, John Ryther, and William O. McLarney. Aquaculture: The Farming and Husbandry of Freshwater and Marine Organisms. New York: Wiley-Interscience, 1972. Egna, Hillary S., and Claude E. Boyd, eds. Dynamics of Pond Aquaculture. Boca Raton, FL: CRC Press, 1997. Pillay, T. V. R. Aquaculture and The Environment. New York: Halsted Press, 1992. Rath, Rajendra Kumar. Freshwater Aquaculture. Jodhpur, India: Scientific Publishers, 1993.
Review of the State of World Aquaculture. FAO Fisheries Department. FAO Fisheries Circular No. 886 FIRI/C886 (Rev.1), Rome, 1997. <http://www.fao.org/docrep/003/w7499e/w7499e00.htm> . The State of World Fisheries and Aquaculture 1998. United Nations Food and Agriculture Organization, 2000. <http://www.fao.org/docrep/w9900e/w9900e00.htm> . U.S. Department of Agriculture. 1998 Census of Aquaculture. <http://www.nass.usda.gov/census/census97/aquaculture/general.htm> .